ESPN 980's Andy Pollin and Rick "Doc" Walker, seen here at the 2008 Hall of Fame induction ceremony of Art Monk and Darrell Green, are veterans of D.C. sports radio. Photo: Mike Frandsen. Two all sports radio stations compete in the Washington, D.C. market, a testament to the fact that D.C. is actually a very good sports town, much better than it’s given credit for. As for the quality of the sports talk, let’s just say that it varies. The competitors are ESPN 980 (WTEM), which has been around since 1992, and 106.7 The Fan (WJFK), which began its all-sports format in 2009. A few of the shows are excellent, with experienced local hosts who provide in-depth analysis and humor in a conversational style. Most of the shows are mediocre, though, providing just enough interest for hard-core sports fans to stay tuned, while some shows don’t give the listeners much choice but to turn the dial. The reviews below are opinionated and don’t necessarily reflect the majority of sports radio listeners. The Sports Reporters: Andy Pollin and Steve Czaban, ESPN 980, 4 p.m. to 7 p.m.
Pollin and Czaban have the best sports talk show in D.C. Pollin, the dean of D.C. sports radio, and Czaban have worked together since the mid-1990s, an eternity in radio, and Pollin has served as the sports director of ESPN 980 since its inception as WTEM-AM 570 in 1992. As longtime D.C. area residents, both Pollin and Czaban grew up as Redskins fans. Pollin’s knowledge of area sports extends to the late 1960s, while Czaban’s goes back to the late 1970s. Each has had no problem criticizing the Redskins during the long suffering period between 1993 and the present. The chemistry between the pair is excellent, with Czaban making the most outlandish statements and Pollin playing the good cop, often reeling Czaban in. Pollin, though, sometimes rides the fence a bit instead of giving a strong opinion. They possess a rare combination of sports analysis and humor, and Czaban, who at times rankled listeners early in his career, has become more personable as he has mellowed. His “Daily Czabe” is a rundown of humorous, even absurd events in the sports world. Czaban has become possibly the number one host on Washington sports radio, with an equal ability to break down games and spontaneously throw in enough humor that works to keep it light. Pollin’s historical knowledge of the Redskins goes back to the days of Sonny Jurgensen and Charley Taylor in the 1960s and George Allen’s Over the Hill Gang in the 1970s. Both Pollin and Czaban are football fans first, basketball fans second, and everything else falls after that. This can be a strength in football and basketball-happy Washington, but the weakness of both of them is their middling knowledge of and interest in baseball and hockey. The “Sports Reporters” has a solid round table of reporters rotating in studio, which gives the show additional credibility. Thom Loverro, Mark Zuckerman, Steve Buckhantz, and Kevin Blackistone are just a few of the local stalwarts who take turns in studio. When Pollin, Czaban, and Loverro talk local sports, all bases are covered and the show goes from great to outstanding. Czabe can be a bit annoying when he talks about politics or his golf game, and both of them can at times be dismissive of the Capitals, Nationals, and D.C. United, but the duo are just two regular guys, longtime D.C. sports fans to whom listeners can relate. As the Capitals and Nationals continue to gain in popularity, Pollin and Czaban would be wise to study up even though they’ve already carved a niche in D.C. sports, one that will hopefully remain long-term. The Sports Junkies: John “Cakes” Auville, Eric Bickel, Jason “Lurch” Bishop and John-Paul Flaim, 106.7 The Fan, 6 a.m. to 10 a.m. The Sports Junkies have been talking D.C. sports together on the air since the 1990s, and off the air together since growing up in Prince George’s County. Avid fans of the Redskins and Maryland basketball, the Junkies know local sports inside and out between the four of them, and their chemistry as longtime friends shows. The Junkies came along at the right time, when sports radio became less about analysis and more about rapport, humor, and story telling. But the Junks bring the knowledge, and doing their homework – following sports – is genuinely fun for them. The show is about more than just sports, though. The Junks talk about women, gambling, and nightlife, though the show can get a little stale when they talk too much about their lives at home. Lurch briefly played college basketball and J.P. was (very) briefly a professional boxer, and all four of the Junkies relate well to athletes when they interview them, asking questions that many reporters would be afraid to ask, but also making interviews loose and fun. All of the Junkies laugh at athletes, listeners, and themselves, and they have even introduced new words into the sports lexicon. “Donkeys” are people who act, well, dumb, but the term is usually used in a laugh-at-yourself type way. “Silly” is used similar to the way that many people use “sick,” to describe an unbelievable play. A “show” is a game, play, or incident that is pathetically bad. Like the Sports Reporters, the Junkies have equal parts enthusiasm and criticism for the Redskins, with a gallows humor about Washington’s favorite team, and a true passion for basketball as well. Bishop brings some baseball knowledge, but like many of the local sports talk hosts, they aren’t particularly strong on the Caps. Still, being football and basketball fans first works in Washington. The Sports Junkies are having a good time, and they make each other and the listeners laugh. The Sports Fix: Kevin Sheehan and Thom Loverro, ESPN 980, noon to 2 p.m.
Sheehan and Loverro anchor the midday slot on ESPN 980. 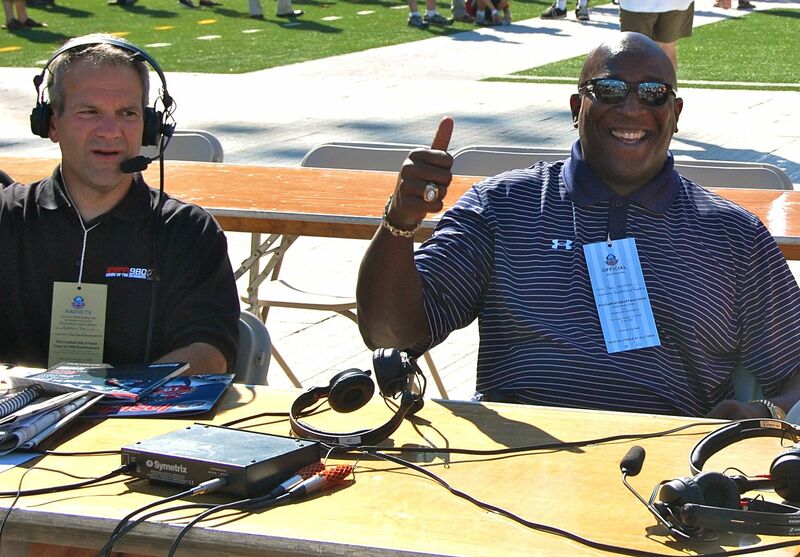 Sheehan rose through the ranks to become a very solid D.C. sports radio host. Loverro, a former columnist for the Washington Times who currently writes for the Washington Examiner, is a longtime observer of the D.C. sports scene and has written books about the Redskins, boxing, and baseball. Loverro was part of a star-studded group of writers from the last 20 years who wrote for the now defunct Times sports page. Everybody in Washington is an expert on the Redskins, but Loverro knows his baseball, a sorely needed skill among D.C. area broadcasters, and also has more expertise about boxing than anyone on local radio. He brings the attention to detail of a writer, and is surprisingly smooth on the air, injecting a good dose of humor along with historical perspective. Sheehan has almost encyclopedic knowledge of D.C. sports. He clearly is a local fan and has an enthusiasm for D.C. teams. He over enunciates his words, a minor quirk, and he has been called “Sheenahan” for his defense of the Redskins’ coach. But his somewhat greater defense of Dan Snyder and the Redskins than most can probably be attributed to a long-standing fandom of the Skins and a hope that things are starting to turn around. Plus, he does a mean weather forecast. Sheehan works hard and keeps up with local sports, which makes sense as he has worked his way up and is not a star. The pairing with the elder Loverro works well, as the sports writer brings decades of experience of covering Washington sports and has a memory bank that goes back further than most. The pair makes more sense than just about any other radio duo. However, it should be noted that Sheehan and Loverro do only a two-hour show, which makes it easier to cover just the most important and interesting sports topics. Brian Mitchell Show with Scott Jackson, 106.7 The Fan, Saturdays, 9 a.m. to 1 p.m.
John Thompson Show with Rick “Doc” Walker, ESPN 980, 2 p.m. to 4 p.m.
Lavar Arrington Show with Chad Dukes, 106.7 The Fan, 2 p.m. to 7 p.m.
Mike Wise Show with Holden Kushner, 106.7 The Fan, 10 a.m. to 2 p.m. Tags:Andy Pollin, Brian Mitchell, Doc Walker, John Thompson, Ken Beatrice, Kevin Sheehan, LaVar and Dukes, Mike Wise, Sports Junkies, sports radio, Steve Czaban, Thom Loverro, Washington D.C.
Lydia Ladybug, Dino the Dog, Leo the Lion, and Roger Rabbit pose for a photo. Photo by Mike Frandsen. Playing with puppets is an excellent way for children with autism and other special needs to practice spontaneous, imaginary, and symbolic play, which can help bring children who think concretely into the world of abstract concepts and ideas. Play dates can enhance social skills, emotional awareness, and learning, and symbolic play can take learning a step further by enabling kids to take part in scenarios to help them understand how the world works. Children with low verbal skills often undergo intensive verbal behavior analysis, speech therapy, and even oral motor exercises. 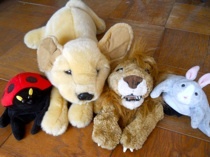 These therapies are often successful to various degrees, but playing with puppets can also bring out speech development and help kids use what they have learned in a natural environment. This post has been brought to you by www.mikeneedsakidney.com. It’s almost time for the Super Bowl, and the Washington Wizards are still winless on the road. The Wizards lost their 24th straight road game, Monday, 102-92 in Dallas. There is no shame in losing to the Mavericks (32-15) in Dallas. But the Wizards should not be 0-24 away from Chinatown. How can the Wizards be so much better at home (13-10) than on the road? The disparity in records doesn’t make sense because the Verizon Center crowd isn’t known for being particularly enthusiastic, and Washington ranks just 20th in the NBA in attendance. It’s harder for NBA teams to win on the road than teams in other sports because basketball players need fresh legs and play more minutes than other athletes, but long road trips don’t explain the Wizards going winless on the road. The Wizards have a young, athletic lineup so endurance shouldn’t be a problem. Are the Wizards partying too much on the road? Do they have a careless attitude? Is it immaturity? Coaching? Low expectations? All of the above?